NEWS ANALYSIS: Some people may be surprised to learn that Norway’s Arctic is “different” from other Arctic areas, thus making oil drilling and production less risky. Or that Norwegian oil production is much “cleaner” and “safer” than it is elsewhere. That’s what increasingly creative government ministers are claiming, though, and they won some support on Monday from international experts. 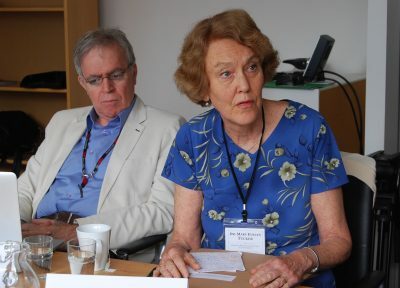 “We’re in an age of irony,” said Mary Evelyn Tucker, an expert on religion and ecology at Yale University. She’s among rainforest advocates who are in Oslo this week for a meeting on rainforest preservation that’s billed as “unprecedented,” and rather creative itself. Tucker spoke at a press briefing just before the Norwegian government started hosting leaders of various religions and spiritual traditions for what amount to unusual climate talks in Oslo. The goal, according to organizers including the United Nations Development Program, is to discuss “the spiritual and ethical responsibility they share to protect rainforests” and thus help fight climate change. Lars Løvold, executive director of Norway’s own Rainforest Foundation, called it an effort “to unite forces” to help preserve the most unique eco- and life-support systems on earth. Both the former Labour Party-led Norwegian government and the current one led by the Conservatives have spent billions over the past decade on rainforest preservation. Government officials also claim they’re committed to fighting climate change. At the same time, however, Norway continues to generate and export millions of tons of the carbon emissions believed responsible for causing climate change through the country’s large and, until recently, hugely profitable oil and gas industry. That paradox has been pointed up for years in Norway and is now gaining increasing international attention, most recently in the New York Times. It’s prompting Norwegian officials on both the left and the right to get more creative in their defense of Norway’s onward expansion of its fossil fuels industry, which is now rapidly expanding into the Arctic as well. “The Norwegian Arctic is different from other parts of the Arctic,” Norway’s current Climate and Environment Minister Vidar Helgesen from the Conservatives, told newsinenglish.no after the press briefing on the rainforest meeting Monday morning. 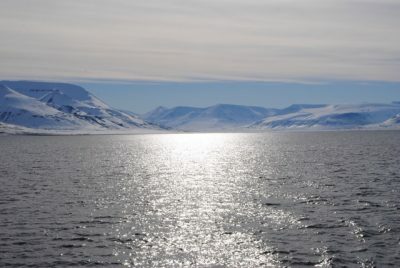 “That’s because of the Gulf Stream, which they don’t have off Canada or the US.” Helgesen suggested the Gulf Stream can make Norway’s offshore areas less vulnerable to the risks of pollution, “because of how the waters flow and such.” Norwegian officials also claim the new exploration blocs being offered to oil companies are far enough away from rapidly melting polar ice. Helgesen and Prime Minister Erna Solberg also insist that it’s important for Norway to keep producing gas because it’s an important alternative to coal and because Europe needs politially stable flows of energy. Helgesen also noted that use of natural gas in the US has helped reduce carbon emissions. 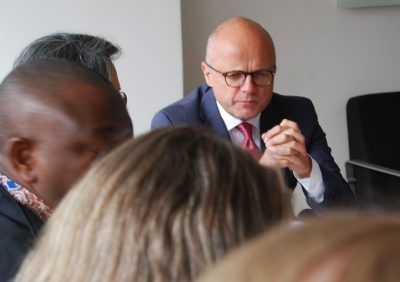 Helgesen, his government colleagues in the Oil Ministry and his predecessors from the Labour Party further claim that Norway produces its oil and gas in a far more environmentally friendly manner, and under stricter controls, than producers in other countries. While that’s been a subject of much debate, Helgesen lauded Norway’s biggest company, state-controlled Statoil, for putting more resources into alternative energy ventures such as wind power. It should be noted, however, that both the former Labour-led government and the current Conservative coalition did nothing to stop Statoil from venturing into its ill-fated oil sands project in Alberta, Canada, which has been blasted as among the most environmentally unfriendly projects in the world. After suffering heavy losses on its oil sands involvement Statoil finally pulled out last year. “We like to say that they went into the oil sands during the Labour government and got out during ours,” Helgesen said with a smile, but stressed that neither government should take credit or blame because “we have a policy as owners not to micro-manage the companies.” He was proud, however, that Statoil has been praised as among the “best” oil companies in the world from an environmental standpoint. Helgesen’s guests in Oslo on Monday were all highly appreciative of Norway’s rainforest initiatives and financial support over the years, even though rainforests keep continue to shrink at “a perilous rate.” Helgesen insisted that rainforest preservation remains “really high” on his government’s agenda, and this week’s meeting is aimed “to bring a moral and spiritual commitment” to it as well. “The urgency can’t be overstated,” Helgesen said, adding that the Paris Agreement “is doomed” if deforestation doesn’t stop. He acknowledged that despite Norway’s huge investment in rainforest preservation, “we’re still coming up short.” He’s hoping that Christian, Muslim, Hindu, Buddhist, Daoist and Jewish leaders meeting in Oslo will mobilize perservation efforts and “bring a spiritual imperative” to the issue. In the end, it often comes down to money and the risk that when profits talk, principles walk. Just as Norway’s economy has been fueled by oil resouces, communities from Brazil to Indonesia can be tempted by economic gain from the rainforests’ wood. The panel even noted that Norway’s oil industry has generated so much money that it’s enabled funding of, for example, the rainforest initiatives and even this week’s meeting. “The respect for Norway is enormous,” Tucker claimed, despite its oil industry that can offset carbon emissions elsewhere. She stressed that the world and its climate are going through huge transition: “This is a transition moment,” she claimed. Helegesen also noted how Norway has been actively working towards restructuring its economy, so that it’s less reliant on oil and gas. The country is indeed in the midst of its own transition. In the meantime, though, the oil will flow while efforts continue to keep the rainforests from being chopped down.